Are 529 Plans Doing the Job? Home	// College Savings 101 // Articles // Are 529 plans doing the job? 529 plans have been around now for 17 years. Separate data reports from Strategic Insight and the College Savings Plans Network (CSPN) last week remarked on the “record” level of assets held in 529 plans. Total assets in 529 plans, including both the prepaid and savings varieties, stood at $227 billion as of December 31, 2013. That’s a 19% increase over the $190 billion total one year earlier. Sounds pretty good, right? Actually, it’s a bit disappointing to me. CSPN data shows that nearly 15 percent of the growth came from investment performance, leaving less than 5 percent coming from net contributions (contributions less distributions). Strategic Insight data shows that net contributions were actually slightly lower in the fourth quarter of 2013 than they were in the fourth quarter of 2012. Overall growth in 529 college saving plans during 2013 was approximately in line with overall growth of mutual funds and ETFs, according to Strategic Insight. I am of the mind that tax-free 529 plans should be growing much faster, in percentage terms, than their taxable counterparts. It’s not as if we’ve reached the college-savings saturation point. Ashlea Ebeling from Forbes hit the nail on the head in her recent column “How Did 529 College Savings Plan Investors Fare in 2013?” She figures that only 8 percent of U.S. college students are currently taking distributions from 529 plans to help pay for college. We should be looking to double or even triple that figure. 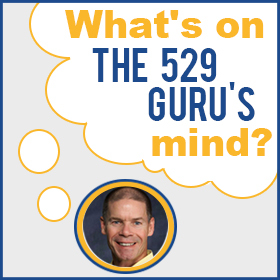 Many American families are still too confused or distracted to open 529 accounts in spite of the substantial educational outreach on the part of the 529 industry. It will take more time and effort to get the 529 asset numbers up to where they should be.